Von 26 Grad und strahlendem Sonnenschein geht es nun direkt über zu 20 Grad unter Null. Der Berg ruft. Und ab jetzt ist Blogpause. This is more true than ever in the last years. I had a problem with my luggage on my flight to Orlando. Delta refused to pay the expenses when I talked to them on the phone. I wrote an e-mail, and never received an answer. So I thought by myself: Just talk to the guys personally. I took the chance on Orlando airport right now. Again they told me there is no refund if the suitcase was returned within 24 hours to me. I replied this is not very customer friendly And it seems to be wrong, too. Because there are different rules if you fly with an international ticket, I learned. Unfortuantly I had not the chance to attend the Closing Session this year, so „Ask the Developers“ was my last sessionI had today. And it was worth it. They recorded the session and will be available as podcast – I guess you will find it at Taking Notes available. So this years Lotusphere took of for me very slow, but it was getting better with every day. I will have some time at my flight back home to think about everthing I heard. 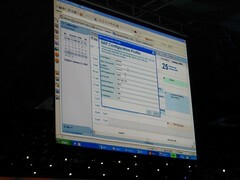 But one thing I can say: I saw very cool technology like the Activity Explorer, Sametime 7.5 and of course „Hannover“. And I saw a very aggressive and innovative Lotus team. That is a good start for this year. This is the coolest thing I saw today: The new Activity Explorer features. I love the concept of activity centric collaboration a lot since IBM came out with it last year. I played around with it for a time, but the slow Workplace Managed Client 2.5 (WMC) was not really fun working with. This changed now. WMC 2.6 is significantly faster, but in addition the new web interface gives you full access to the Activity Explorer functionality. IBM plans to release the Activity Explorer as a separat server component, so even Non-Notes or Non-Workplace Shops can use it. Actually it is only a 70 MB installation file, and the server runs on a Tomcat installation. Unfortunatly nobody could tell me how IBM will deliver the final version – maybe as standalone version as well as as part of the Workplace server. You can integrate any third party application, and I just saw the Firefox and Microsoft Word Integration. Want to add your contract document to a recent activity? Simple press a button in MS Word and there it goes. Through using the web interface on a separate server infrastructure you can use this tool for collaboration within your organization as well as with external co-workers. Simple invite them via e-Mail and they can work with you on a project or activity. You can keep the overview of your threads not only in the client or web interface, you can have all the information pushed to your favourite RSS reader. I got a demo of Activity Explorer in „Hannover“ as well, and it looks even better there. Really – I can´t wait to get this thing up and running in my office. Es war ja bisher eher traurig bestellt um die Open Source Community im Bereich Groupware / Collaboration. Eine Zeit lang schauten wir auf den Suse Linux Open Exchange Server (SLOX), aber so richtig kam keine Begeisterung auf wenn man die Messlatte in die Höhe von Lotus Notes und Domino legt. Das scheint jetzt anders zu werden. Bei der Open Xchange Gmbh sammeln sich die alten Lotus Recken – also die, die nicht zu Symantec und Adobe abgewandert sind – und bringen neues Leben in den SLOX, der nun zum OX mutiert. Zusammen mit Collax, dem via VC Geldern hochgepäppelten ehemaligen „Ben Hur“ Alleskönner-Server, könnte das eine spannende Kombination werden. Habe gerade Postvon mir selbst bekommen. Denn wer den Groupware Magazin Newsletter abboniert, bekommt den täglichen Kluge. Sollte ja hier mal kurz gesagt werden. Finde ich. In eigener Sache quasi. Oder so. Yesterday evening we went sky diving with the guys from IT Factory. No, not the real thing, it was a sky diving simulator. But it was a hell of a fun. So if you are now here at Lotusphere and you have the chance to visit the SkyVenture – do it now. There are only five of these tunnels in the world. Well, it was late in the night again when we finished the day at the Dolphin bar. I missed the first session, and I might have missed the second session as well if these guys in front of my hotel room were not talking so loud about this „freaking cool piece of software called Workplace Forms“. I attended the Workplace Forms session yesterday and I can confirm: It´s a cool piece of software. And I am happy theses guys did my wakeup call – Ed Brills „The Boss loves Microsoft“ session was excellent as always. Received that wunderfull giveaway yesterday, a multicharger that connects to your USB port and has multiple adaptors for cell phones – like my Nokia 9300. So it seemed this is the solution for me. But ItDoesNotChargeMyPhone. Volker, I need your help again. Someone got Tylenol for me? The last night at Jellyrolls Duelling Piano Bar killed me. I have to admit: I was less excited about this years opening session than expected. On my way to Lotusphere I feared I might know everything they will tell us – IBM and business partners like us hosted so many events during 2005 so there can not be any breaking news. But yesterday IBM made me believe todays opening session will be the best ever. Well, it was not. The Non-US-residents never heard of Jason Alexander, and his part on the stage was less exciting than Patrick Stuart aka Captain Picard on stage talking about his relationship to Shakespeare. Well, at least the US visitors enjoyed Jason Alexander very much. We heard about double digit and triple digit growth.Double digit growth in Lotus software sales, double digit growth in Lotusphere visitors (really? ), triple digit growth in Workplace customers. So, how many (paying) Workplace customers existed in 2004? Notes/Domino 7: Fastest adoption ever of a new release, full functional Mac and Linux client available as well as Domino Web Access on these platforms. 120 million users of Lotus Notes world wide. A continous success story. Tight Notes/SAP integration, which does make sense. Announcement of multiple partnerships in the mobility and pervasive technology sector, like with RIM, Nokia or IntelliSync. So, where is all that WebSphere EveryPlace technology? While mobile device support becomes a part of the core product in competitors messaging plattforms, IBM relies on third party vendors. Many other usefull things are improved or added: You can instantly connect to your buddy with a voice connection, you will be able to integrate your VoIP solution and location awarness has been added. Today is use Skype for IM chat and voice, Sametime for internal chat and presence awarness only within my Notes environment and Plazes provides location awarness. Tomorrow Sametime might be back on my desktop and provide all this for me. What I really don´t understand is IBM building solutions on top of Workplace. Why the hell do they deliver solutions like Workplace for Business Reporting & Controls or the Workplace for Business Strategy and Execution? This used to be the IBM partners business for the last 15 years. I don´t get it. There might be some partners who are not happy with this. But there is another interesting fact: The most recognized tools at this years Lotusphere are not build by IBM. It´s Bowstreets Portlet Factory and PureEdge´s Workplace Forms. Both companies and the solutions have shortly been acquired by IBM. And I must say: I am really impressed by Workplace Forms. It may solve lots of problems. And the best thing is: You can use it in Workplace as well as in pure Notes environments. Activity Explorer: This is my personall favourite since the Workplace Managed Client came out. In the new version IBM added many missing features. Now you can add objects to an activity thread not only within the Workplace Managed Client. You will get full access to this from a web browser and from the Lotus Notes Client. And activity threads will be available as RSS feeds, which is a major improvement for me. And finally „Hannover“. „Hannover“ aka Lotus Notes 8 will be shipped in 2007, but the live code we saw was amazing. I wonder why they did not show the chicklets like Kevin Cavanaugh did it at the last DNUG conference. Well, I had my camera in position. Anyway, I can´t wait to get my hands on this. „Hannover“ supports all Notes applications, it actually IS the new Notes Client. There are no additinal cost, it comes with the next major update, and it looks great. It will stop all discussions about Outlook providing the better UI. „Hannover“ will require a Domino server only. Well, probably a Domino „Next“ server, which was anounced today as well. And from what I saw in the demo, the Domino „Next“ server web interface looks exactly like the Websphere Portal / Workplace interface. So Domino „Next“ will probably ship with a bundled portal server. So I will better not make any predictions about performance and hardware requirements. So all in all a good start. Let´s see what we see and learn in the sessions and labs during this week. This is a good start for Lotusphere 2006: IBM makes fun of their own acronyms. It seems I am not the only one arriving in Orlando without my luggage. Meanwhile my suitcase arrived, but I had to buy and rent the golf stuff for yesterdays „Lotusphere Open“ golf tournament. Someone at the golf course told me to charge this back to Delta, but Delta refuses to do so because they only pay 25$ per day if the luggage is lost mor than 24 hours. I can not believe this, so has anybody experience with that and knows a way to get the money back from Delta? Yesterday I played my first golf tournament and we finished our game with four points under par. Well, it was not my swing that made the game, but I had some good puts and learned lots of usefull things. Most important: If you do a scramble like we did, you need someone like Michael from Ascendant Technologies, who plays golf like a pro. Second lesson I learned: The higher a team members position in the IBM hierarchie the better the score of the team in the golf tournament. Does this mean if you are on an executive position you have to play golf like a god or is it the other way around: in an execuitve position you have enough time to practice and improve your handicap? Anyway, it was big fun. And thanks to my team members Dean, Peyton and Michael for your patience. Missed my flight in Paris, forgot my camera in Berlin, bought an new one in Atlanta, crashed the camera and can not replace it in Orlando. So what else can happen while traveling to Lotusphere? Yes, Delta lost my luggage on the trip from Atlanta to Orlando. And it does not look like Delta really cares about this. Since I lost a significant part of my iTunes music library in a crash I am using SharePod. This nice little tools that lets you sync your music back from iPod to your PC without installing any third party tools on your PC – the program itself resides on the iPod. Of course you should not do with it what the name of the program may imply. Now a friend of mine has a similar problem: iTunes library on an Apple Notebook is gone, the iPod holds lots of music, and only a Windows Laptop is available. Does anybody know a tool that lets you sync your music from an Apple formated iPod back to an Windows based laptop? No, buying an Apple computer is not an option – even if it would be the better choice.